Benjamin Geskin for iDropNewsA fan-made render imagining how the iPhone 8 may look, based on leaks and rumours. The upcoming iPhone 8 might ditch the fingerprint scanner in favour of facial-recognition technology. It sounds futuristic, but it could be a massive pain to use. For months, there have been reports and rumours about how Apple was trying to build the fingerprint scanner directly into the screen of its next smartphone. For the tenth birthday of the iPhone, the Californian technology firm is believed to be pulling out all the stops, giving the device a radical redesign that involves an almost edge-to-edge screen and the scrapping of a physical home button in favour of an on-screen button. But the home button, a mainstay of the iPhone since its unveiling in 2007, has since 2013 also hosted Apple’s Touch ID fingerprint scanner, which can unlock the device and authorise payments via Apple Pay. After trying to integrate it beneath the screen, the latest reports from Bloomberg reporter Mark Gurman and KGI Securities analyst Ming-Chi Kuo — both of whom have a reliable track record when it comes to Apple news — suggest that Apple is planning to ditch Touch ID altogether and go for a 3D sensor on the front capable of unlocking the phone by recognising the user’s face in a fraction of a second. But where it gets more tricky is payments. In global cities like London, contactless payment options are extremely widespread, and can be used for everything from buying groceries in the cornershop to paying for buses or trains. These are often instances when your face is often nowhere near your phone, or out of its camera’s line-of-sight. When you pay for a London bus, for example, the contactless reader is roughly waist-height, and you tap your card or phone at it in passing as you walk. If you have to stop every time to line it up with your face, it will be a massive pain, and likely to hold others up. The other alternative is that users are allowed to disable biometric authorisation for payments of the iPhone 8 — which would either force them to enter a time-consuming passcode each time, or make the payments system less secure overall. Or, Apple could capitulate and add a fingerprint scanner to the back of the phone, as other alleged leaks have suggested the company has experimented with. But doing so would be an ugly and unsatisfying solution, and an admission that the facial recognition tech isn’t fully up to the task. 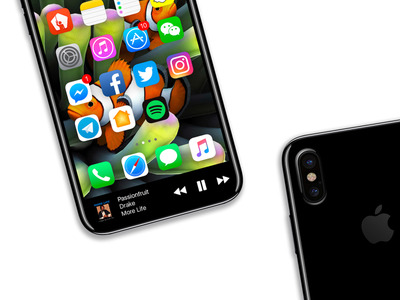 We’re only a few months away from the expected Autumn launch, and as the leaks and rumours continue, we should slowly get a clearer idea of what Apple has planned. But don’t expect the company to confirm or deny any of this ahead of time — it almost never discusses unannounced products.